Join us in podcast land once again (iTunes and RSS feeds are on the right of this page), to hear Miss Narciss Ohkravi, consultant ophthalmologist at Moorfields Eye Hospital talking to comedian Kent Valentine and regular host Steve Cross. Narciss brilliantly explains how we see and shares some stories from eye casualty departments. Kent spends most of the podcast staring into Steve’s eyes. 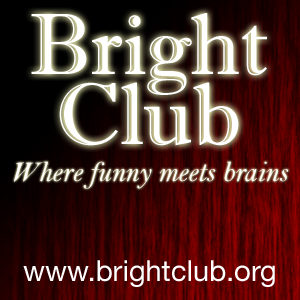 June 14th – Bright Club: Heroes! NOTE DIFFERENT LOCATION AND DAY OF THE WEEK TO NORMAL! IT’S THE WORLD CUP’S FAULT! When the sun comes out, Bright Club responds as any sensible animal does. By burrowing underground to get away from the nasty, nasty rays. Because rays, as we all know, either give you a tan or superpowers. Both of which would make our lives complicated. Our iTunes link is over on the right. Can you see it? Down a bit. Down a bit. There it is! 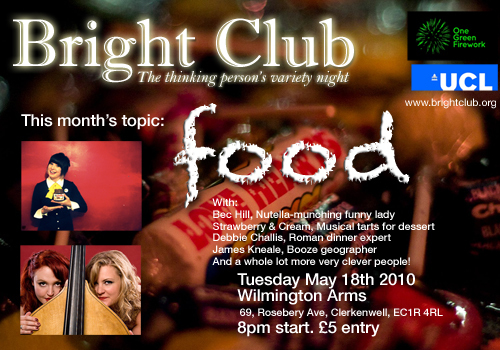 On May 18th, Bright Club is back in its normal home (the Wilmington Arms) for a decadent night of chocolate, fine drinks and intellectual titillation. Featuring the insanely-funny Bec Hill who eats chocolate spread as a meal, and isn’t afraid to tell you about it. The gorgeous Strawberry and Cream. Their luxurious musical style will make you want to buy them dinner and cocktails. James Kneale, geographer, who knows where, why and when Britons get blathered on booze. Debbie Challis, archaeologist, who could host a MUCH more genuine Roman dinner party than specky Heston Blumenthal. Laura Ishiguro, historian, who has spent way too much time worrying about what weird, lonely men had for tea. Sanna Hirvonen, philosopher, who has better taste than you and can explain why. Stuart Hine, entomologist and entomophage, who still has bits of locust leg in his teeth from dinner yesterday. Fiver to get in. 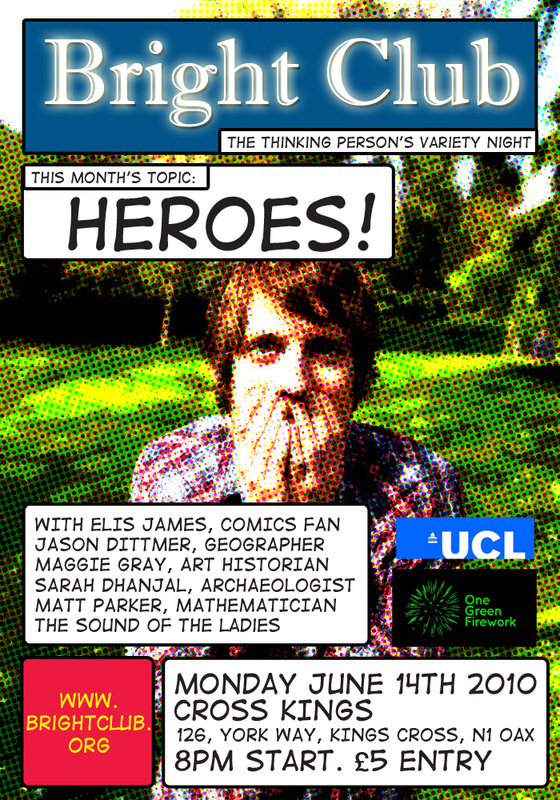 Free sweets to take away those hunger pangs… Doors at 8pm!